January 10, 2010 Dan O. This Bart guy sounds pretty wild. Already dealing with his parents’ divorce, sad-sack Danny Stein (Steven Kaplan) faces his next big emotional challenge: asking a girl to prom and getting her into a hotel room after the dance — something even total dweeb Bart Beeber is confidently planning. But as Danny’s prospects dwindle, he turns to ever-more desperate measures to score the perfect date. Brian Hecker directs this teen comedy that co-stars William H. Macy and Alia Shawkat. One thing you will notice very quickly about this film is its wonderful setting. The Hollywood/Florida Jewish community that everybody’s got an opinion on who he should take to the prom, and it was very funny to see how all these people interacted within this culture. The humor here in this film is grounded, which is a good thing and bad thing. It works cause its not as totally over-the-top with raunch, but yet its not as funny as them kinds of films, and just comes off as an awkward look. I think some of the jokes could have been as funny as others, just with a bit more raunch. There is a lot more heart in this film than comedy, and it really does work out. The relationships that these three people have and their own characters work well, as each is able to work off the dialogue with one another as the story moves along. The last ten minutes work very well, and in such a heart-warming way too. Kaplan gives off a good strong lead performance, and holds his own throughout this story. But the best here is H. Macy who shows that he can play almost anybody and make it seem believable. He has these constant little sayings that are just so so funny that they are so hard to ignore. 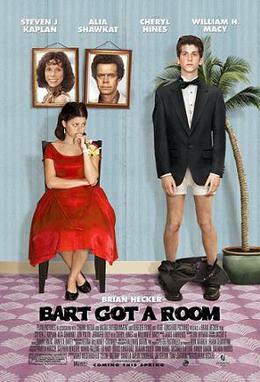 Consensus: Bart Got A Room doesn’t contain much raunch and not as much humor as other teen-comedies, but features just enough heart and good performances to make this trip worth awhile. Thanks for the review. I would truly appreciate if you copied and pasted this great review into the user review section of Bart Got a Room on imdb and rottentomatoes.